Saturday October 1st sees almost 400 lots hitting the auction block from Chamberlain Auctions. This auction is loaded with vintage die cast metal cars, trucks, tractors and souvenir banks by Ertl, Buddy L, Tonka, Nylint, Structo, Match Box, Hot Wheels, Maisto, Corgi, John Deere, Hubley and more. Also included are vintage dolls and Barbies by Effanbee, Mattal, Vogue, Fisher Price, Ideal, Disney, Gabriel, Gerber, Kenner, Horsman, Cabbage Patch and many more. This is an auction toy and doll collectors can not afford to miss. The catalog is currently accepting bids right up until auction day and the live auction begins selling at 10AM Eastern Time. Lot 66 presents a great toy for collectors of pedal cars. 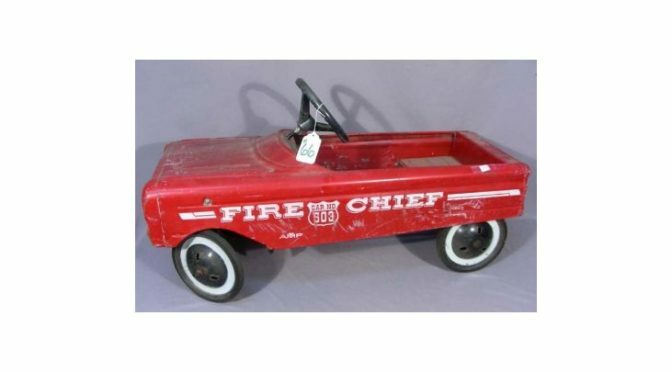 This is a vintage AMF Fire Chief #503 Red Pedal Car, selling to the highest bidder. This measures 18 inches high, 34 inches long, and 13 inches wide, and there are a pair of good photographs in the online catalog. Other highlights for collectors of firefighting include a vintage Tonka Fire Truck TFD serial #5 that is 17 inches long and available for bidding at lot 75. Next at Lot 76 bidders can also grab a 195-‘s Tonka Gas Turbine Fire Truck that is 15” long. Both trucks are great as part of a toy display and are both opening for only $15. The auction has some awesome selections of classic hubcaps. Lot 197 offers four 1965 Mustang Spinner Hubcaps, all for one price, to the highest bidder. They are in good condition. Other offerings include 4 Chevy Nova Dog Dish hubcaps at Lot 148, a set of four vintage Buick hubcaps at Lot 153, and a great pair of vintage Pontiac hubcaps possibly for the late 1960’s Grand Prix model. All sets are available online with photos and ready to ship. There are 75 lots available throughout the auction with dolls from all sorts of makers and periods in history. Lot 266 gets bidders a chance to have a beautiful 1985 Cabbage Patch doll boy with brown hair still in its original box. Lot 294 presents a vintage 1983 Marilyn Monroe doll by Roger Richman Productions in style #71890. There is a certificate of authenticity included and bidders get this doll in its original box. The doll is 18” high and looks great for display. Doll collectors are encouraged to get into the catalog early and browse and highlight everything they want. Chamberlain Auctions are a great source for exclusive art, antiques, jewelry and collectibles. This auction will be fast paced and a lot of fun. Interested bidders can contact the auctioneer through the website to ask questions, and the auctioneer can provide all the information.